Earlier this week we invited one of Jonathan’s language school friends to our house for dinner. He is a newly ordained French Catholic priest who has been assigned to Cambodia for life. He hails from the Alsace region of France. When Jonathan asked him about the most beautiful place he’s ever been, he answered that it was his own region. 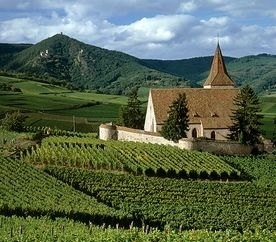 His home in Alsace, the place of his roots. He told us he believes that if you cannot love the place you come from, you cannot love the place you go to. So I dropped out of the dinner conversation for a few minutes to contain my emotion. What a beautiful thing to say. He loves his home, but he has sacrificed living there because of love for his God, and his heart is open to love this place and its people as well. I am not sure whether it is the French-English language difference, or simply because he comes from a different faith tradition than me, but his words were filled with grace and meaning for me. Tears welled up in my eyes. Yes, I love my home. Yes, I love the people who live there. Yes, I love my God, and yes, I love this place. I fully intend to love the people of this place. I want my heart to be open to love. Then this Sunday I experienced my first non-English church service. Jonathan had attended non-English services before — in Cambodia and also in Russia and Germany — but I had not. I had not expected it to impact me quite so much (not because I thought I was immune to such things, but because I had not taken the time to think about it, silly me, mother of 4 young children, too busy getting ready for church to stop and think). 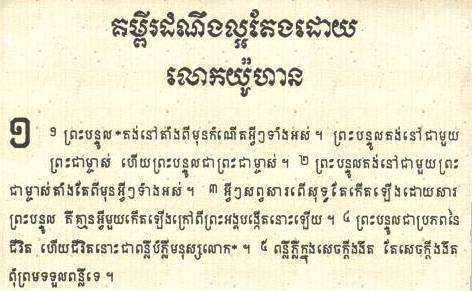 I could reliably understand only a few words: “thank God,” “Jesus,” “love,” and “hallelujah.” I could not read the Cambodian song books; I did not recognize the melodies. But I worshipped all the same. It was at this service that I finally understood, at my very core, that Jesus does not speak only English. His offer of salvation is for all nations. Oh, of course I “knew” that before, but there, in that small gathering of Cambodian believers, I truly realized that God speaks all languages with the same perfect skill. He understands each Christian across the globe, no matter their language. He does not understand me better than He understands a Khmer Christian — even if I do not understand that same Khmer Christian. What I said to my kids later was, “Isn’t it neat that everyone can talk to Jesus? Isn’t it neat that Jesus can understand everybody?” I hope they can grow up strongly convicted of what I am just now learning. I haven’t blogged for a while. I tend to wait until something significant happens, something that really affects me. I had two of those events this week and wanted to share them with you. As always, thank you for praying for our family and for the people whose language we are trying to learn. We want to communicate the Gospel to them in their own words. We want to communicate the Gospel to them with much love. And this week God sent me those two little reminders, much-needed missionary lessons. Hi, Elizabeth, great to stumble across your blog. I’m not sure how I found it on a random Google site, but I am also from KC, and my husband and I are living in Poipet. I used to work at Children’s Mercy, and some of my Truman friends in the ER mentioned your family before we left for Cambodia last year. Glad to see your family’s name again and maybe we will cross paths on a random trip to Phnom Penh sometime. Always good to meet another Kansas Citian! Give us a holler when/if you’re ever in PP. I remember checking out your blog a year or so back…and now we’re all here! Wow. all for ONE, Jonathan T.
Elizabeth & Jonathan – You are such an inspiration to all! Thank you for sharing your thoughts and experiences and please know that your journey is a mission not only to the Cambodian people but to everyone your blogs reach. I have been truly blessed to follow your news. My grandfather, Joseph Widmer (Vittmer) imigrated to the US from Alsace Lorraine which I believe was German at that time. It is a part of my roots I hope to visit some day. We miss you at Red Bridge and look forward to seeing you when you come home! Elizabeth, I love your writing. It is so expressive and clear, and I am so happy you are adjusting so well to your envirment keep writing. Jonathan keep preaching!